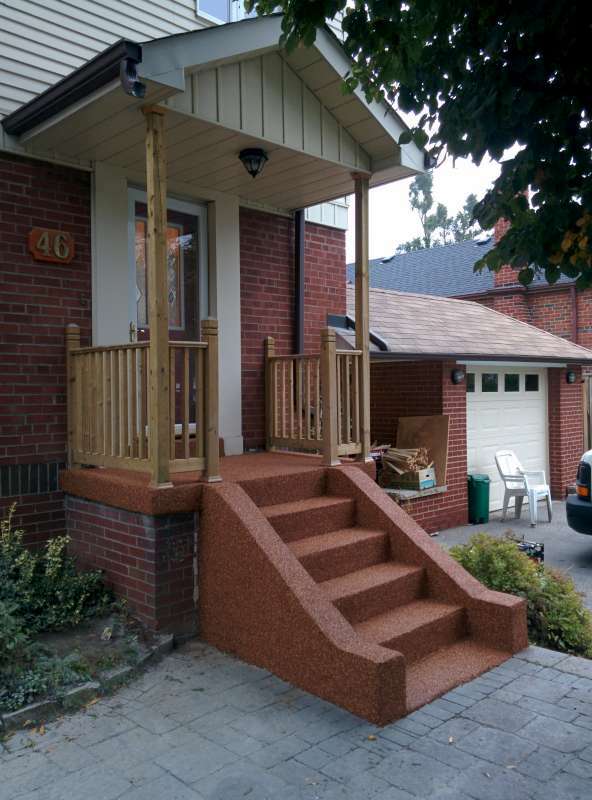 Details: Concrete front entry and stairs with a patio stone walkout to the curb. 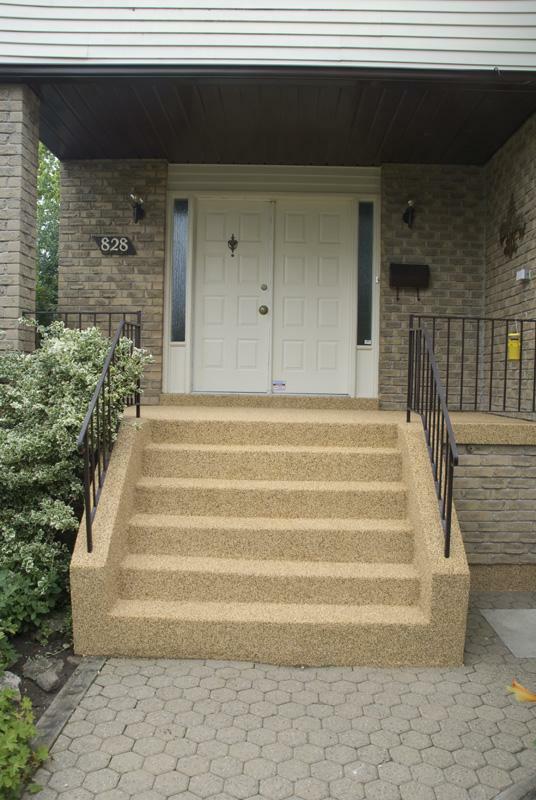 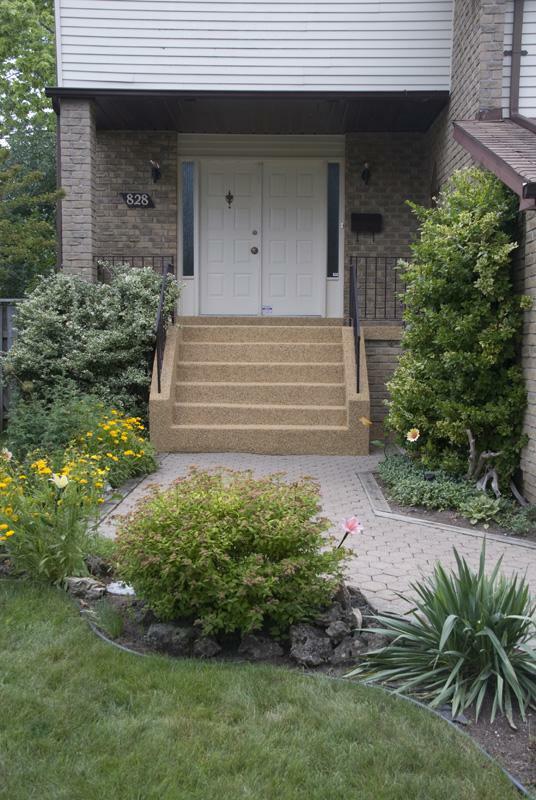 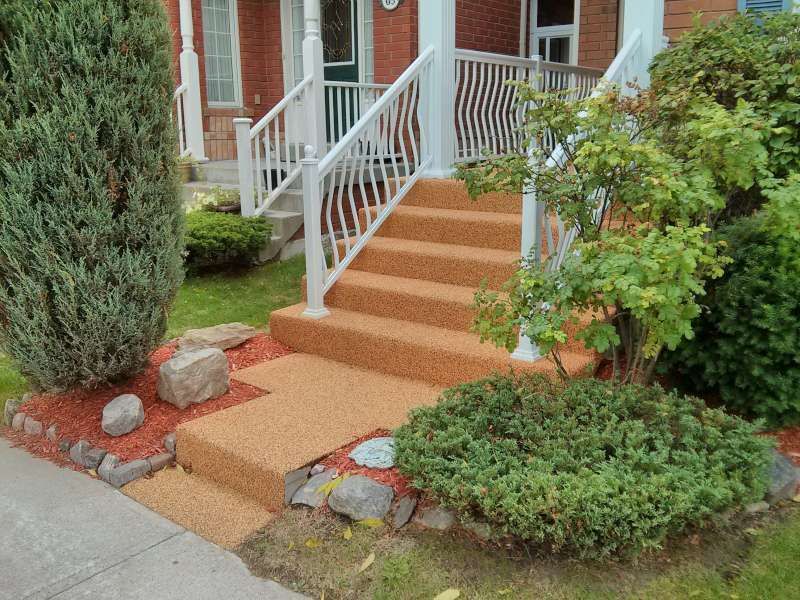 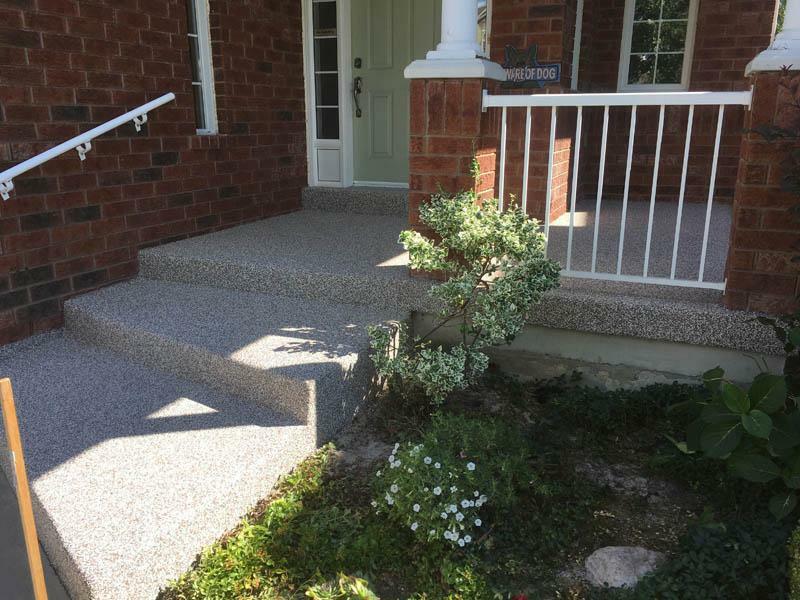 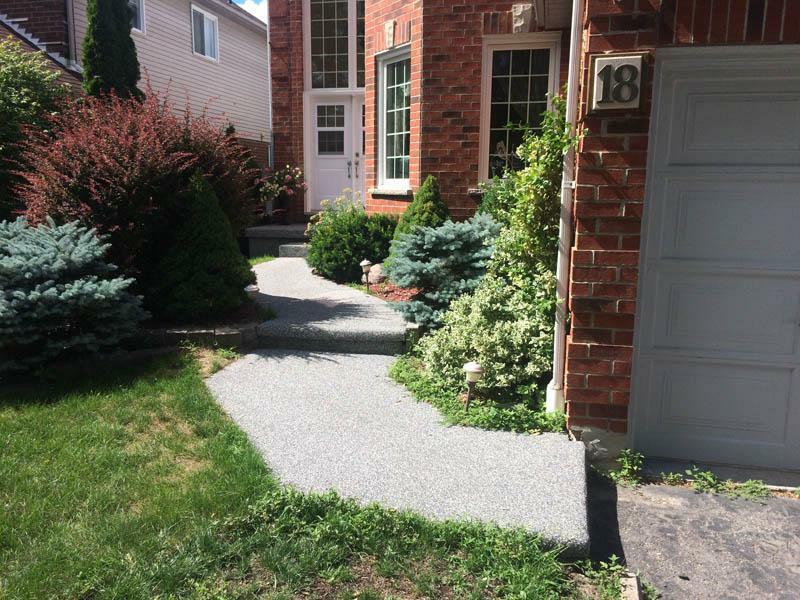 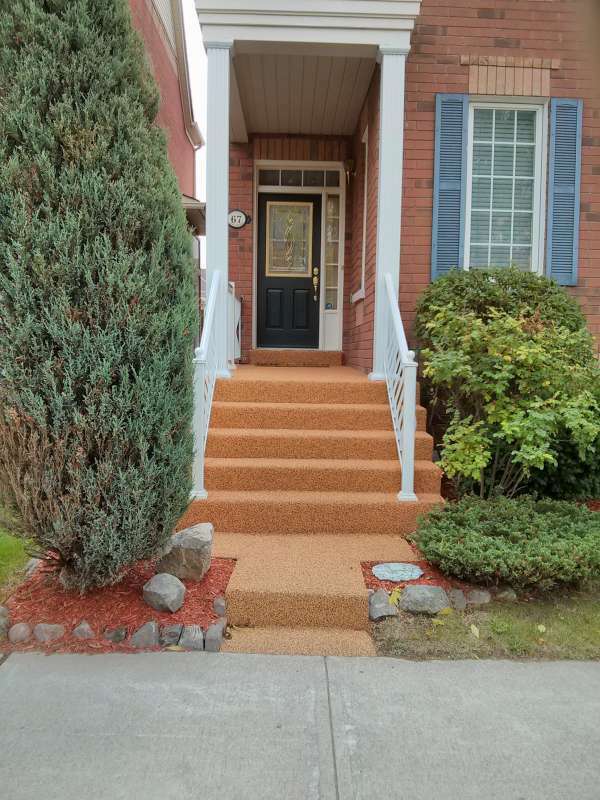 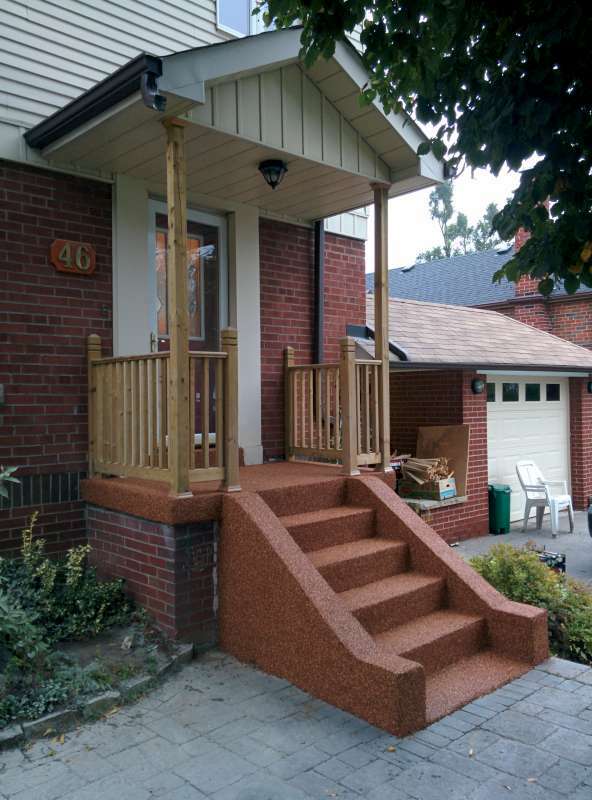 The entry, stairs and patio stones were all resurfaced to create a seamless and safe walkway from the front door to the sidewalk. 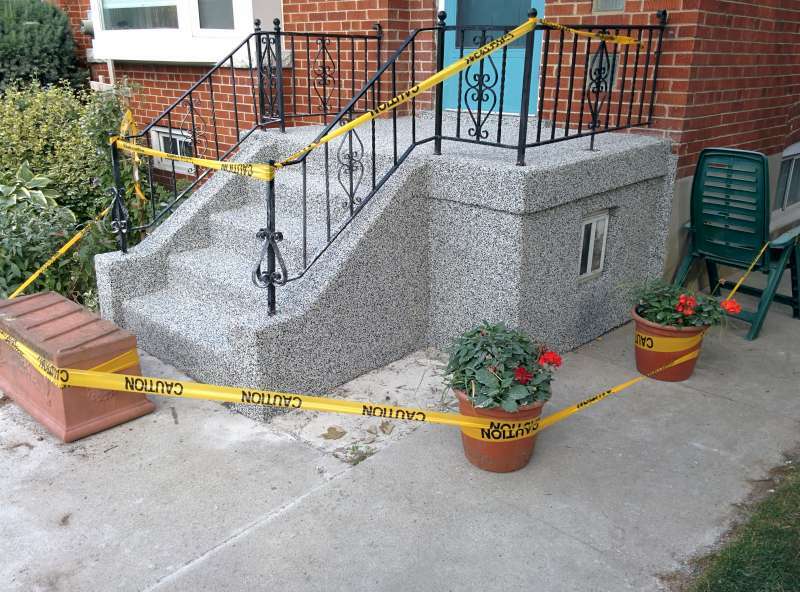 Details: Safety was a main concern for these old and worn down concrete steps. 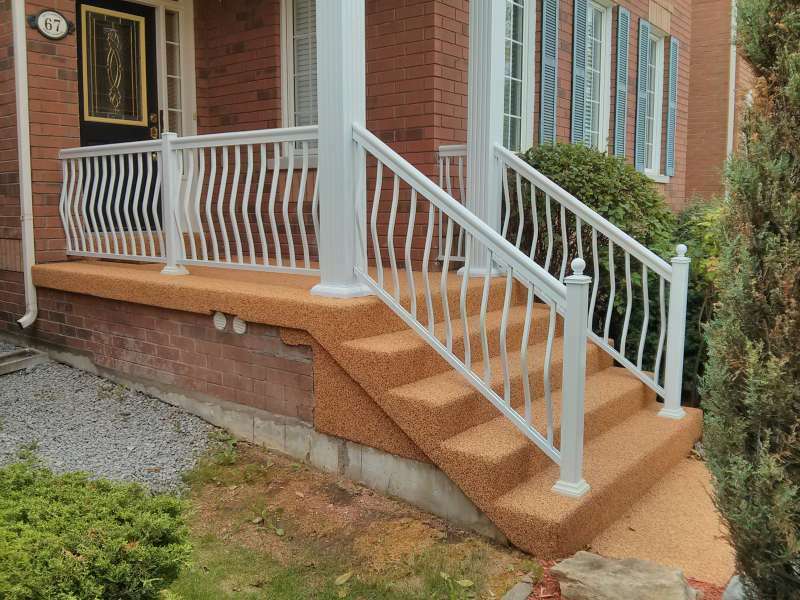 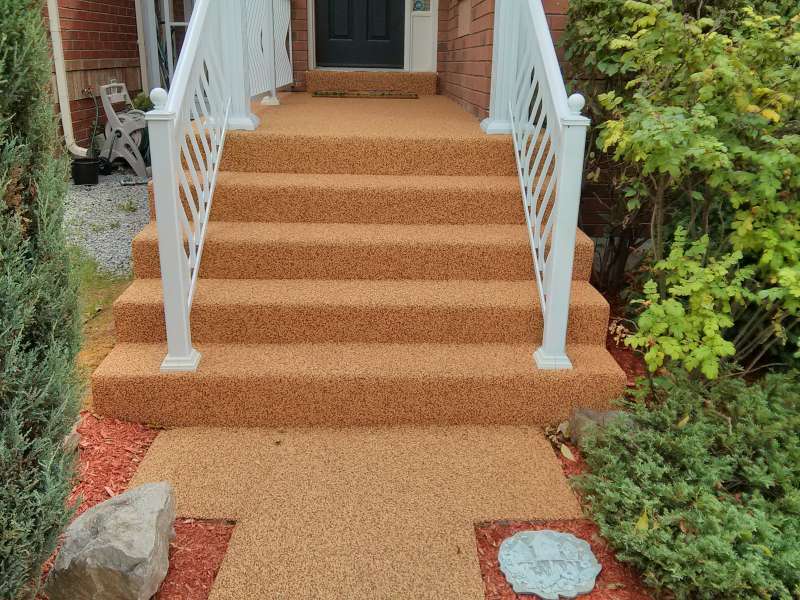 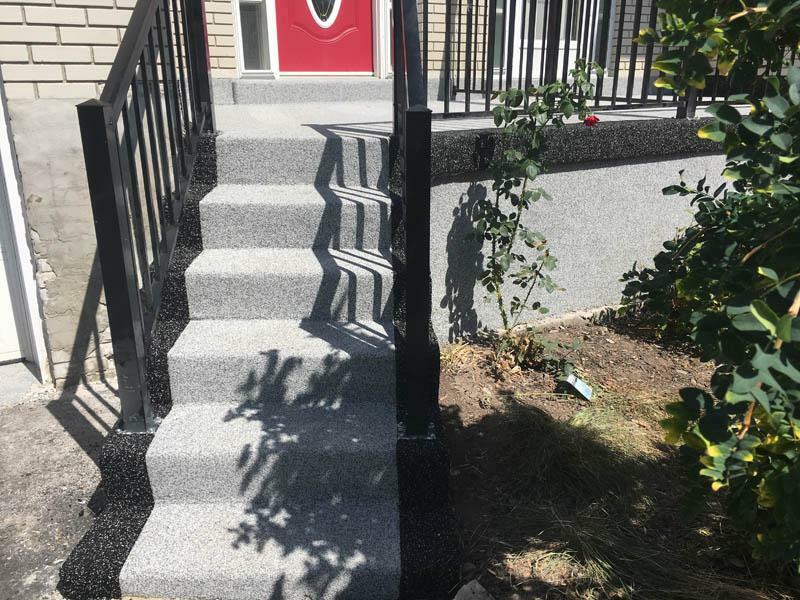 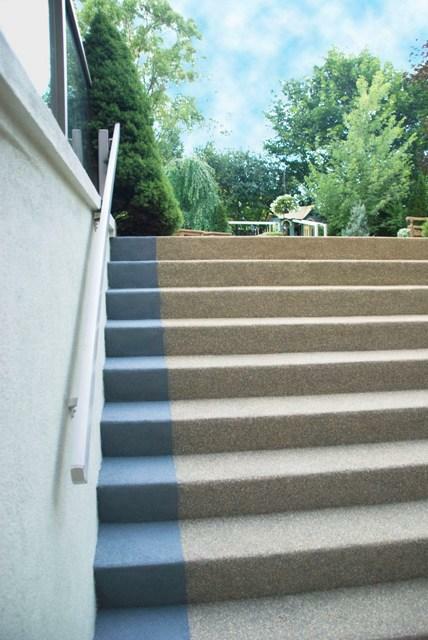 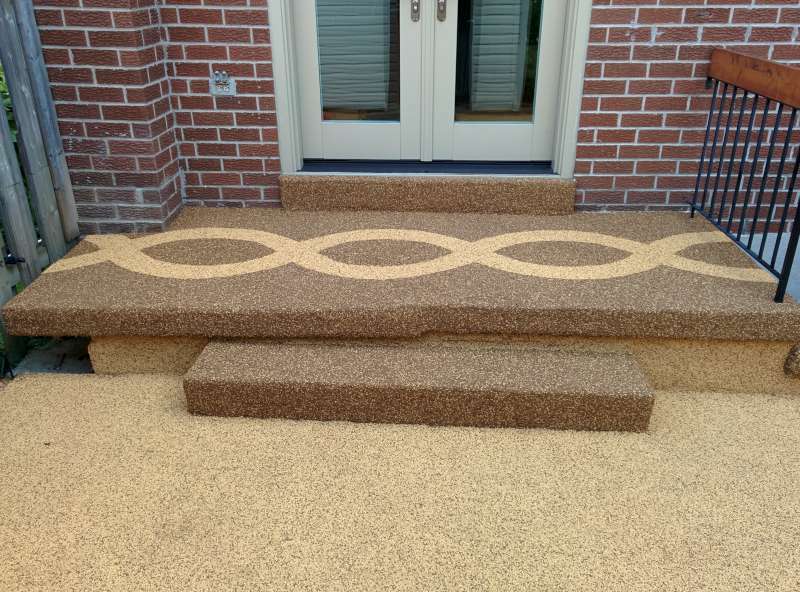 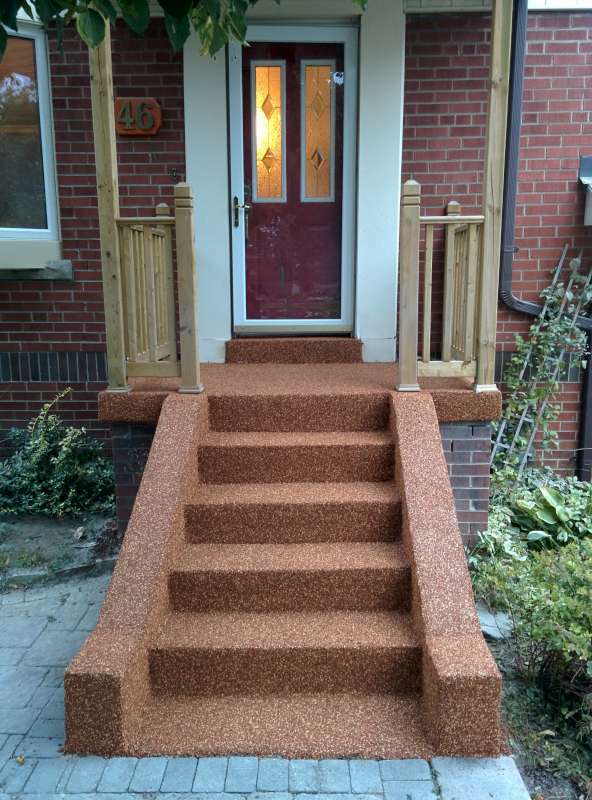 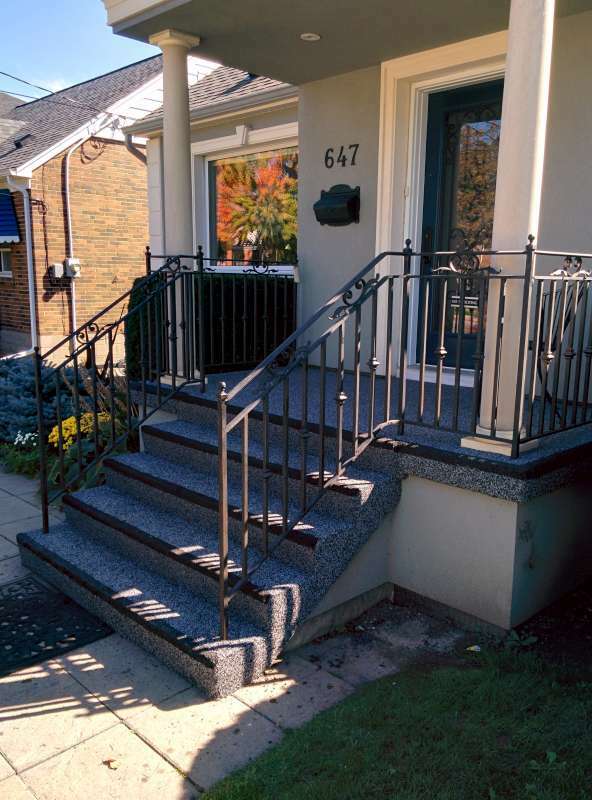 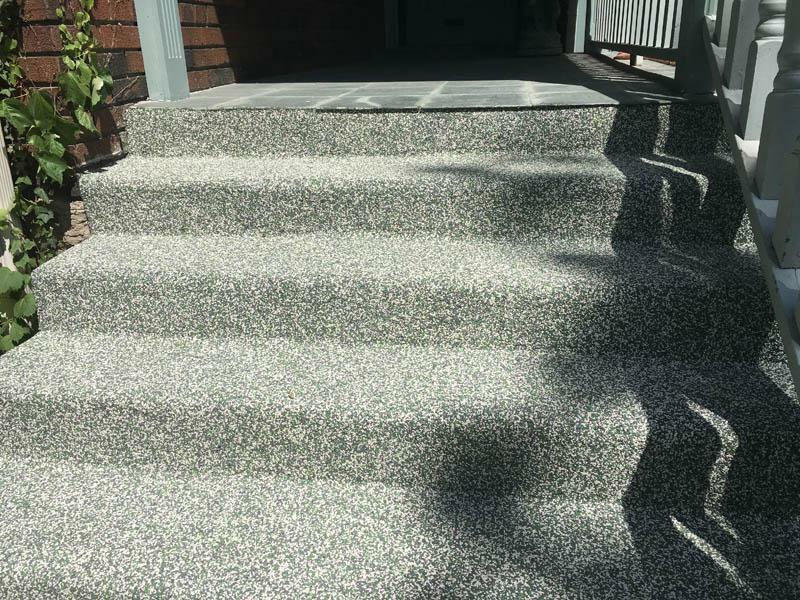 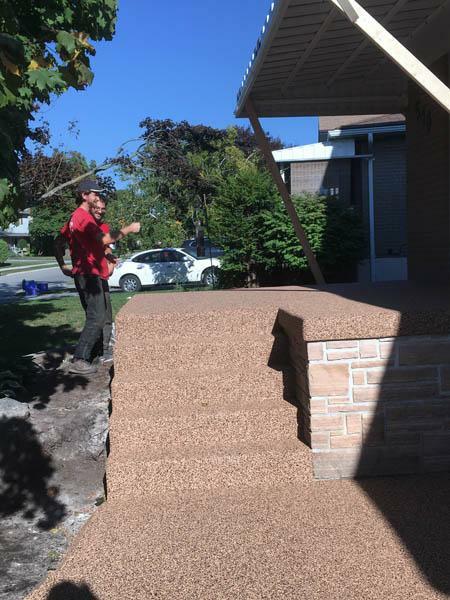 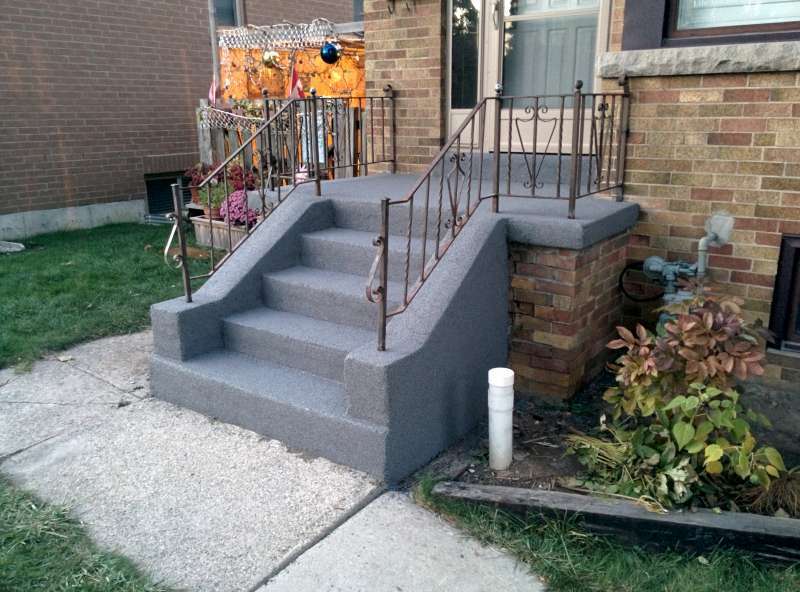 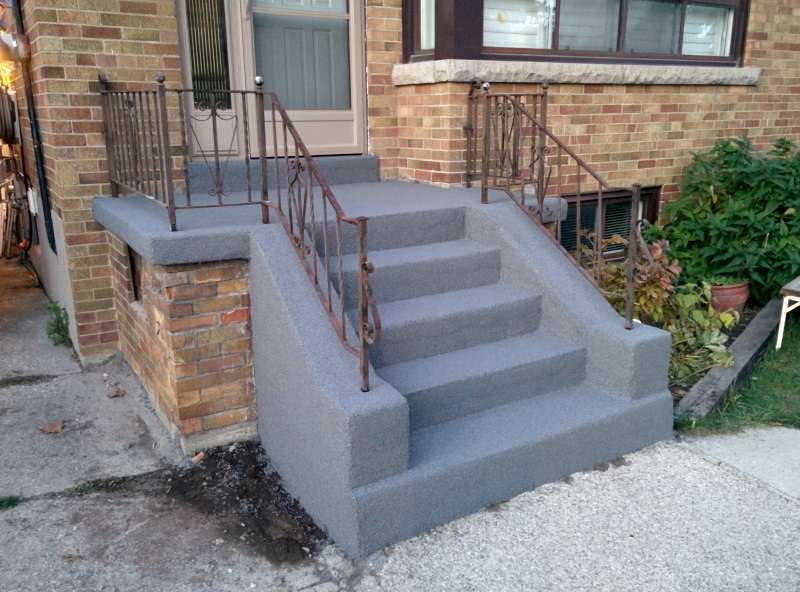 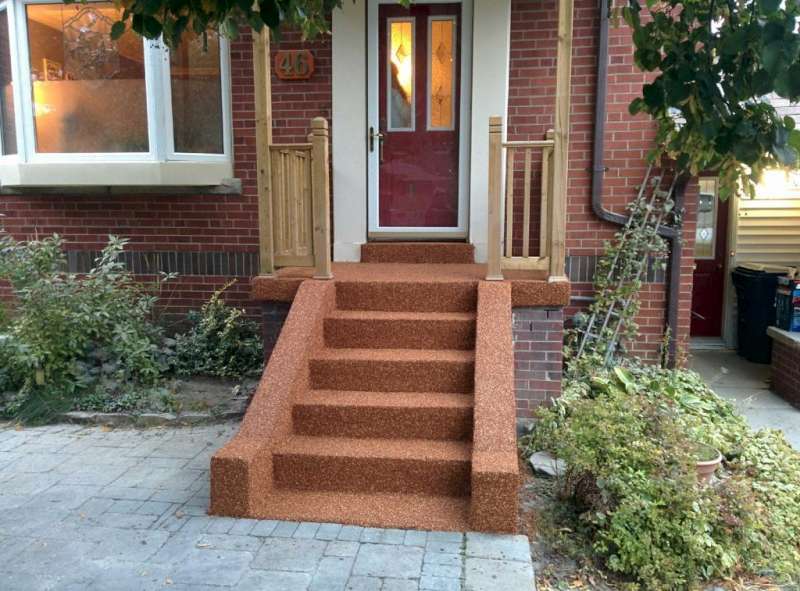 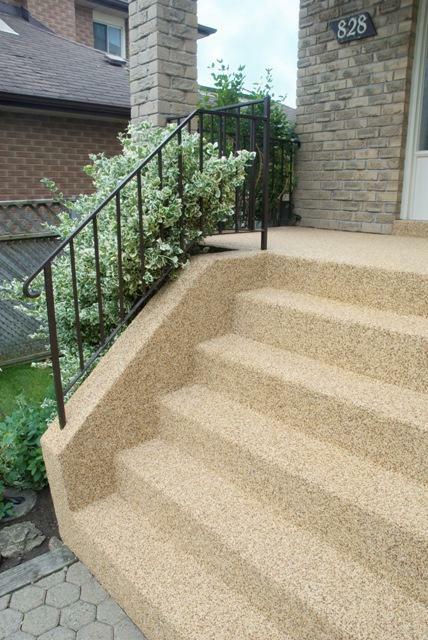 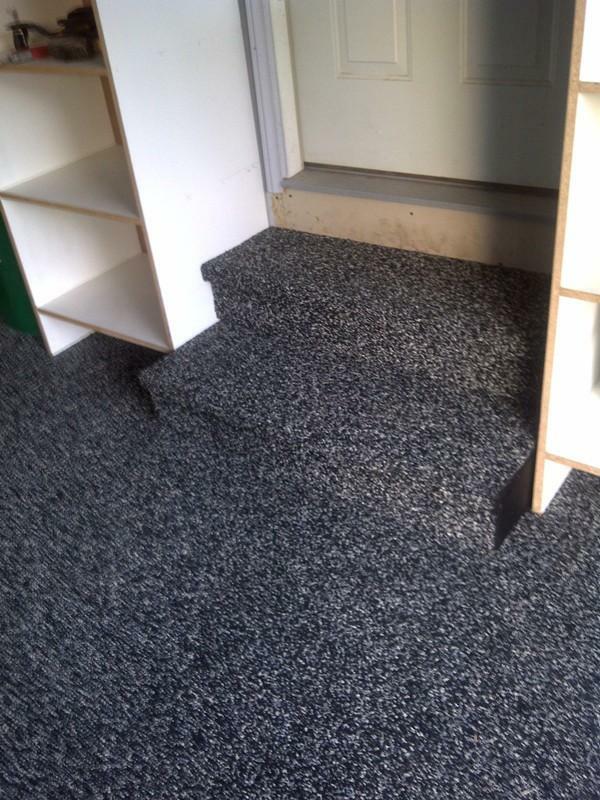 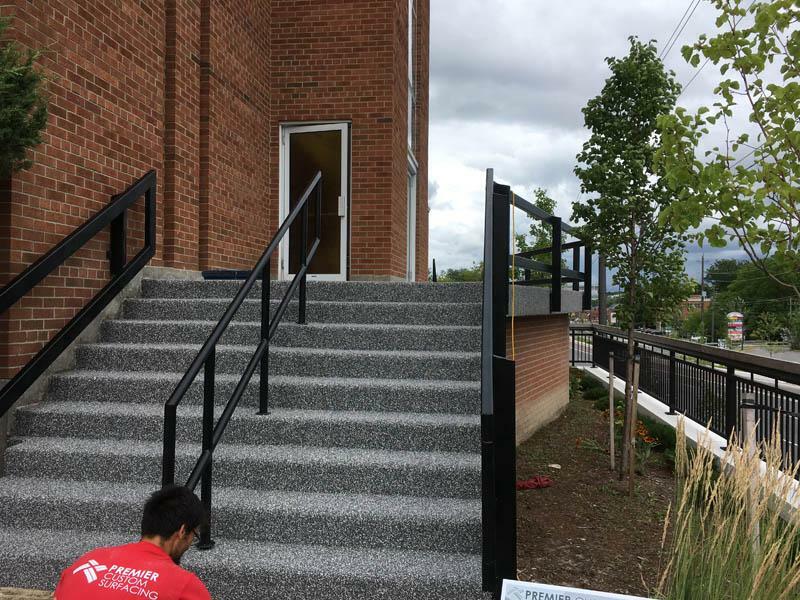 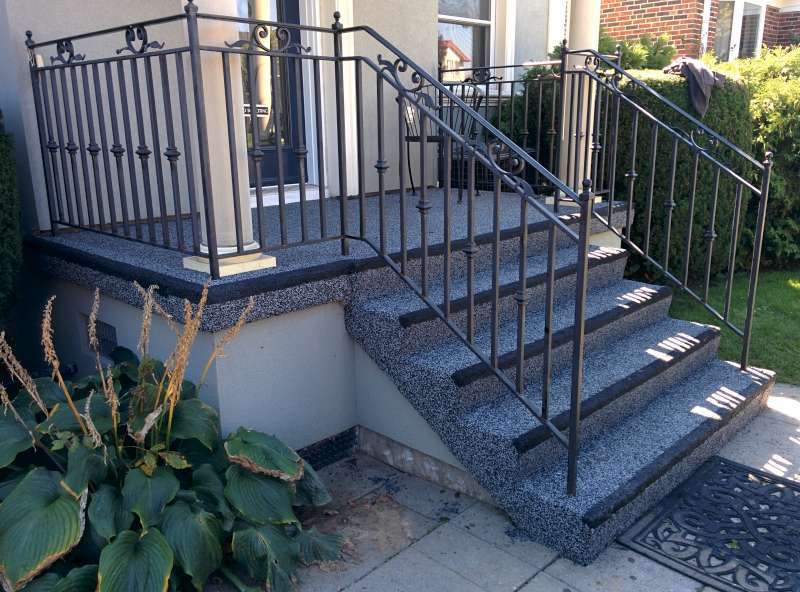 Constantly slippery, and dangerous before resurfacing, the new stairs are safe and slip resistant for a beautiful and safe entry to their house. 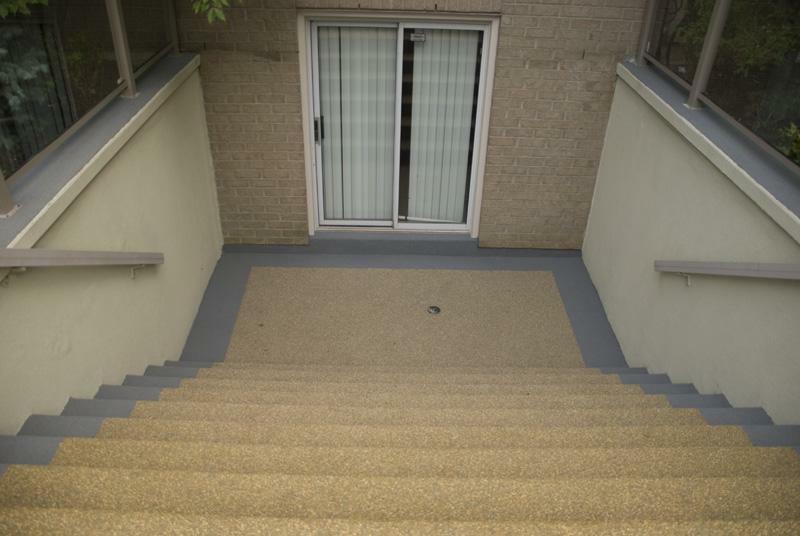 Details: These rear entry stairs had become unattractive from water stains and wear. 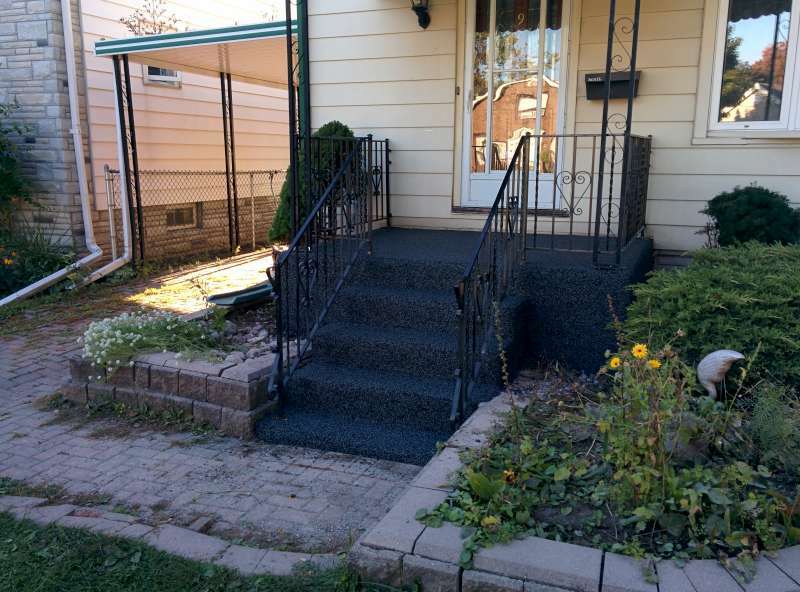 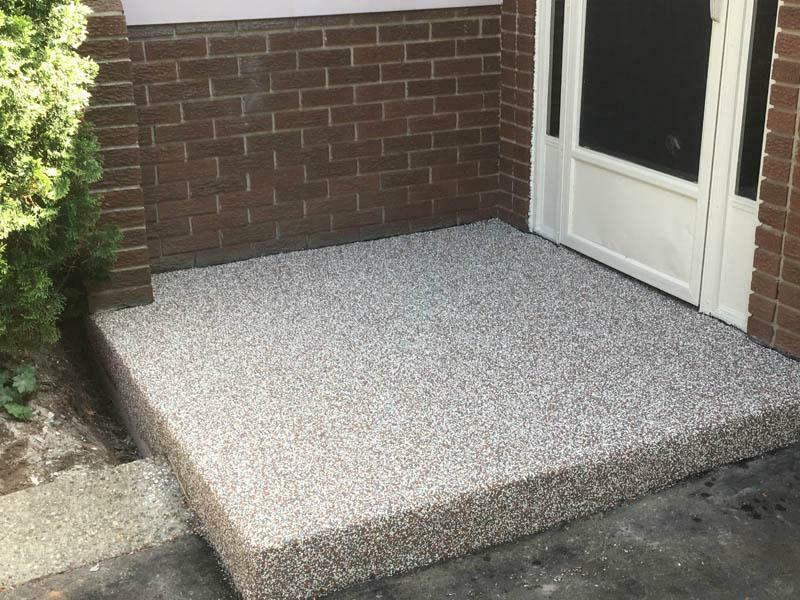 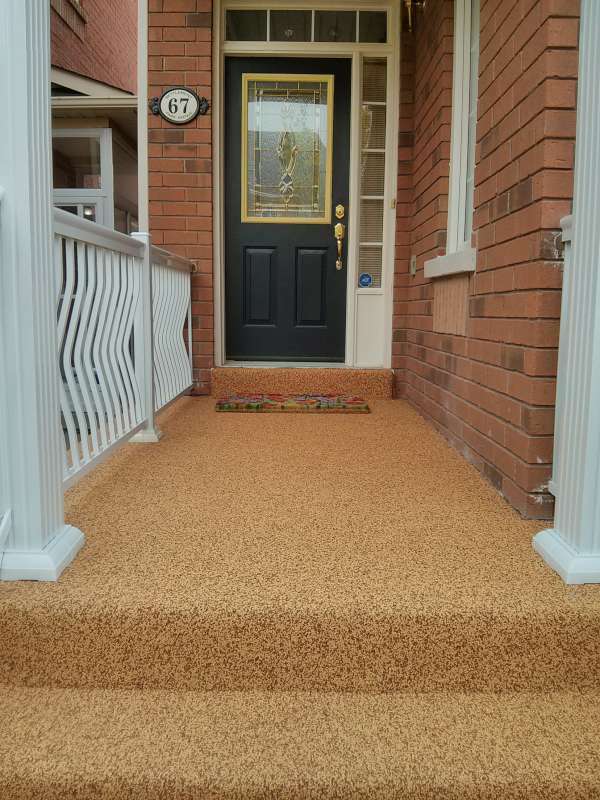 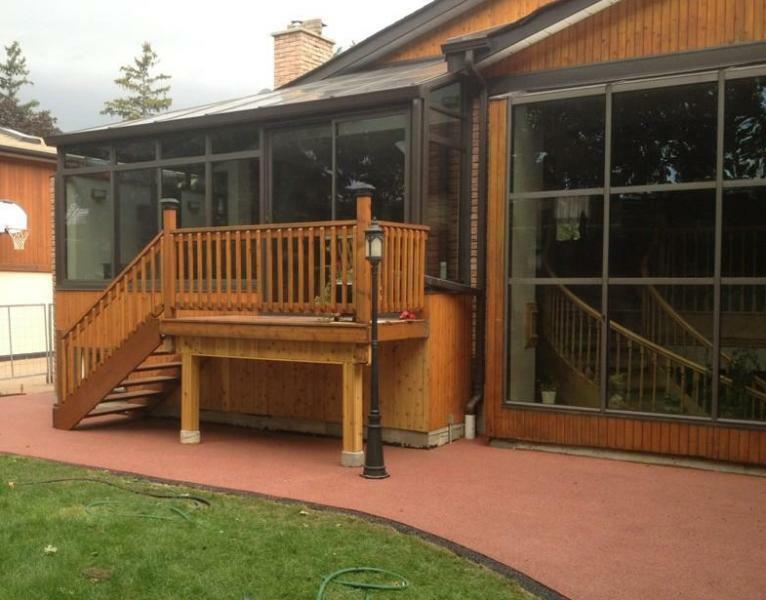 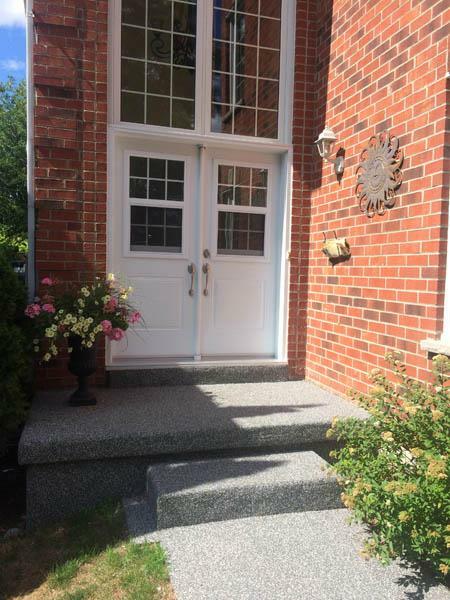 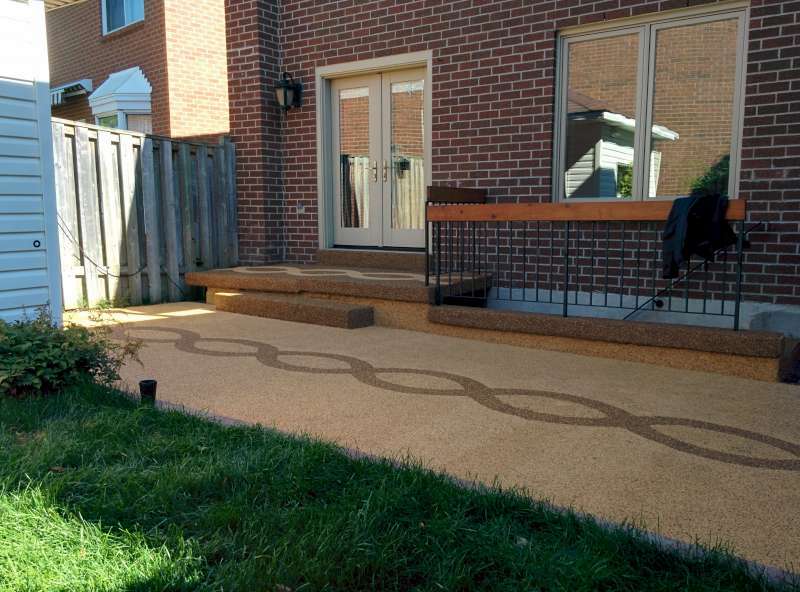 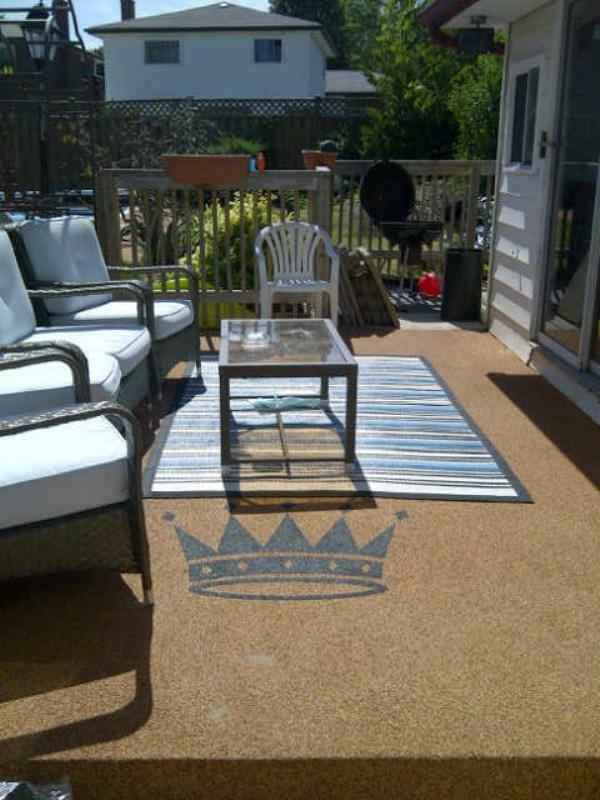 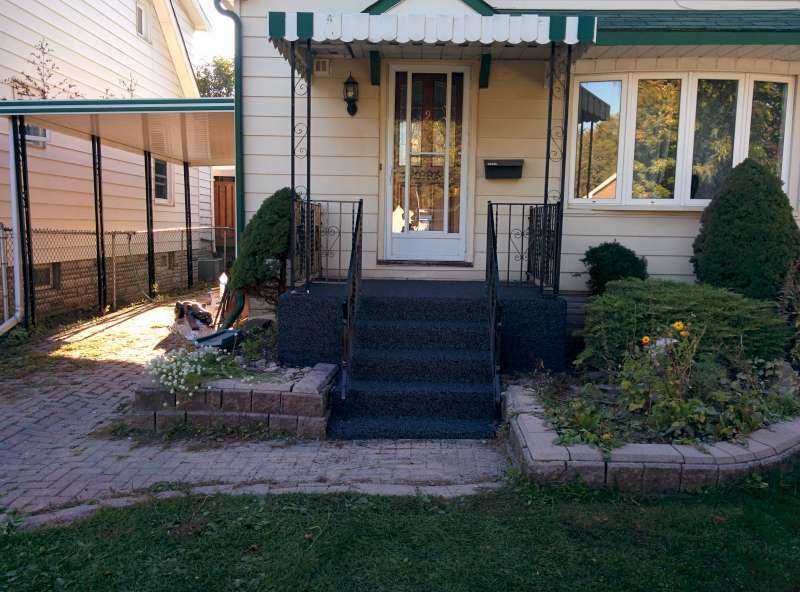 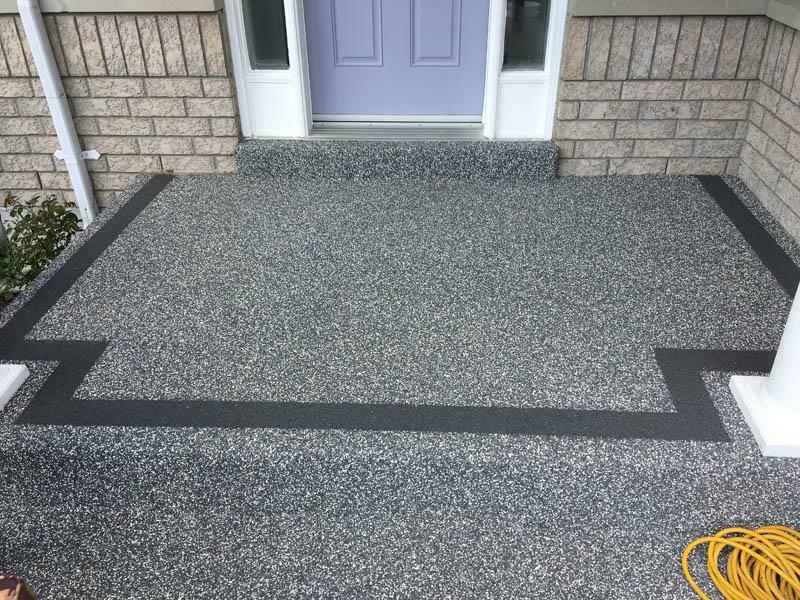 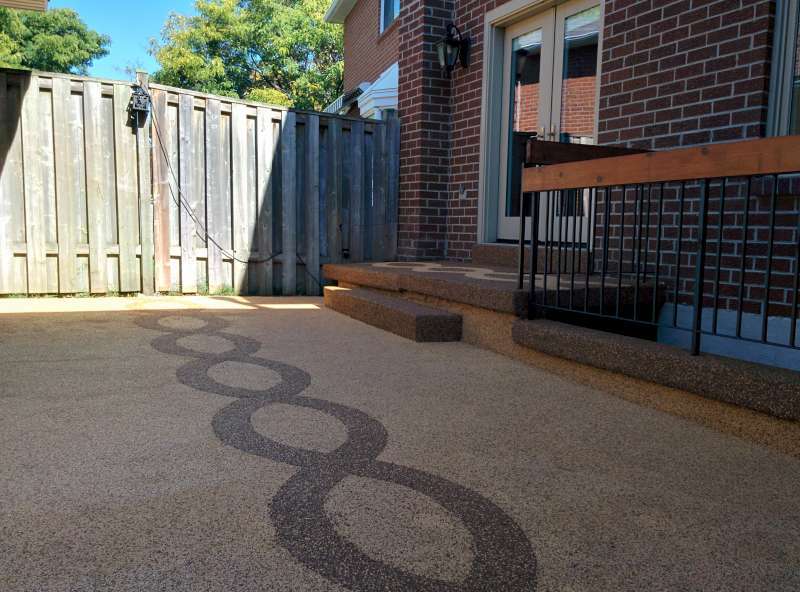 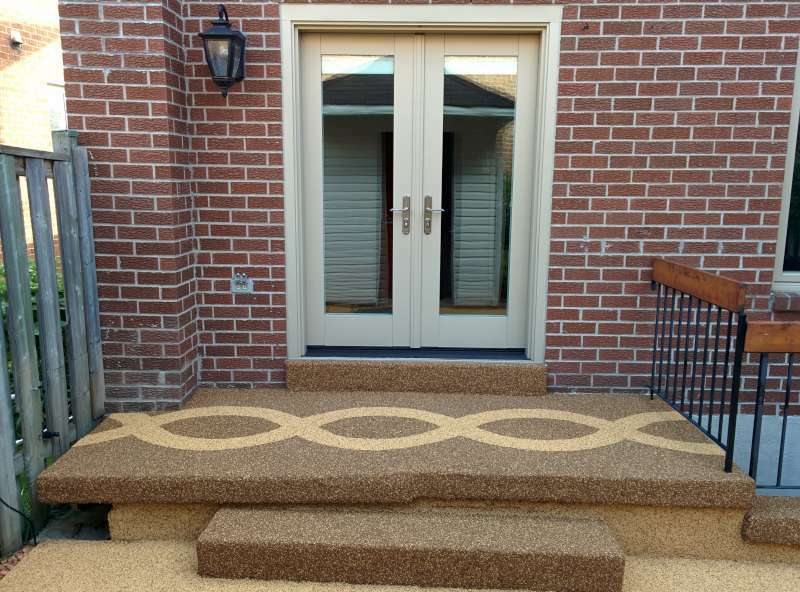 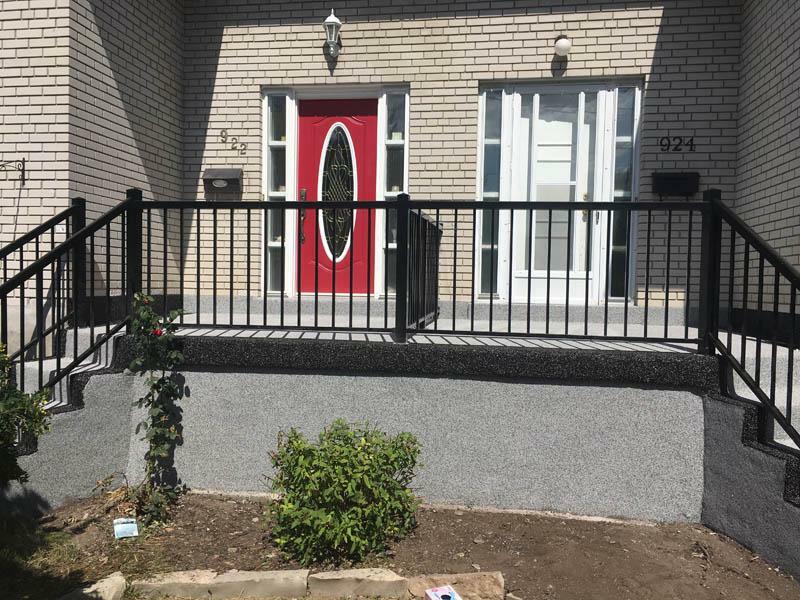 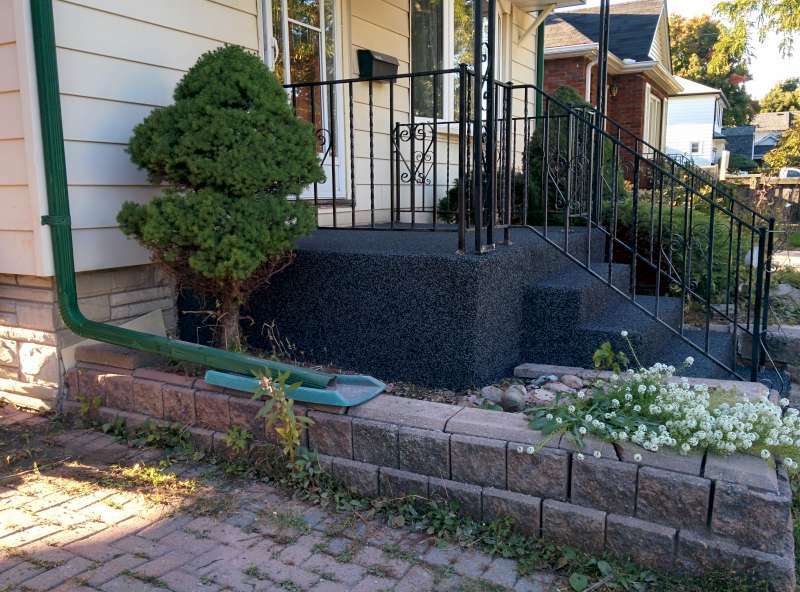 They were resurfaced using EPDM Rubber and inlayed with a custom boarder running down both sides and across the threshold of the house for a custom appearance to match the house. 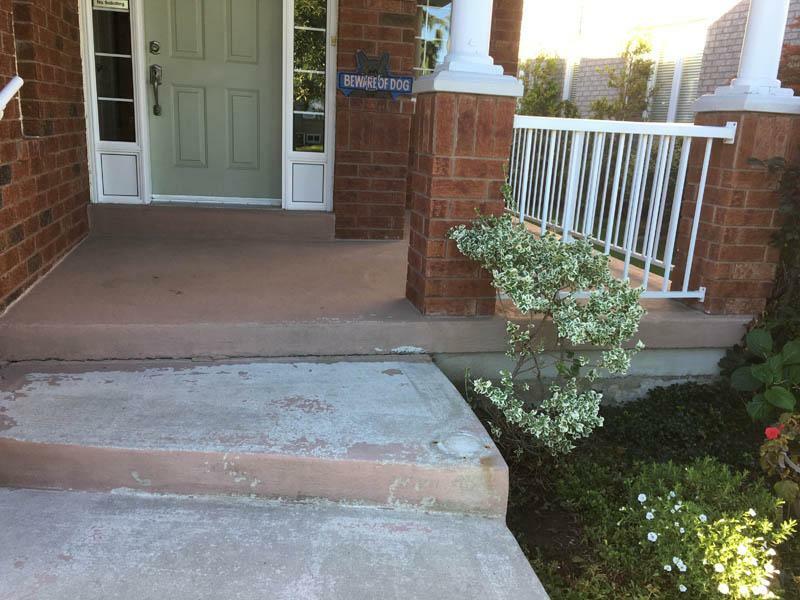 Details: Concrete front entry that had been covered with slate tiles had started to deteriorate and become un-safe for the residents. 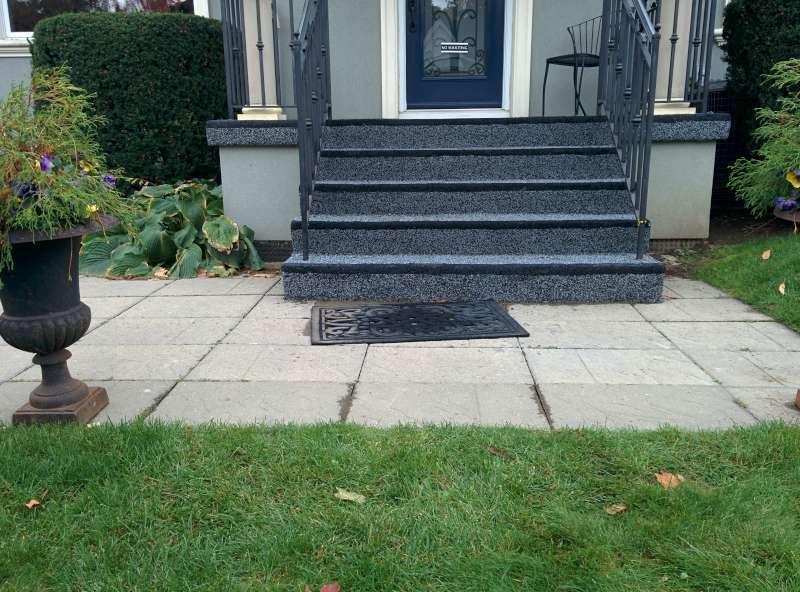 The slate was removed and the concrete re finished using EPDM rubber and polyurethane resin. 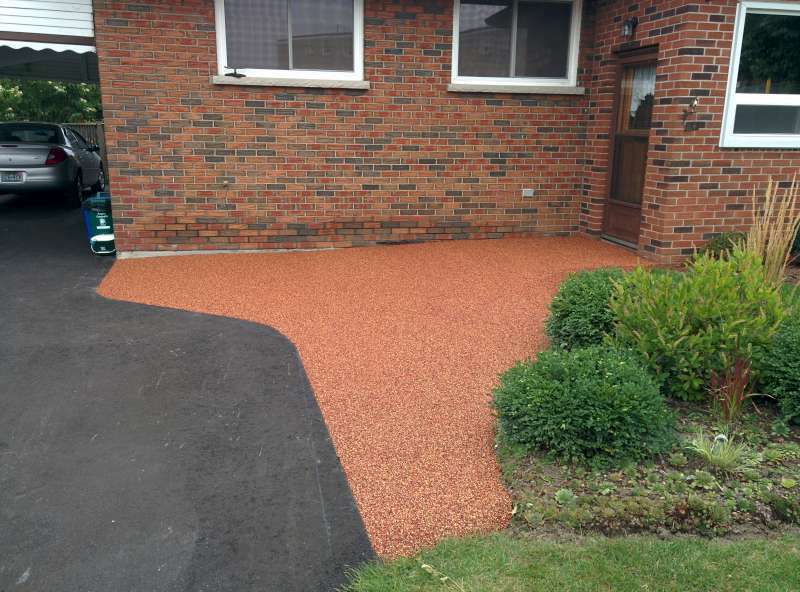 The completed area is now a safe and easy to maintain area. 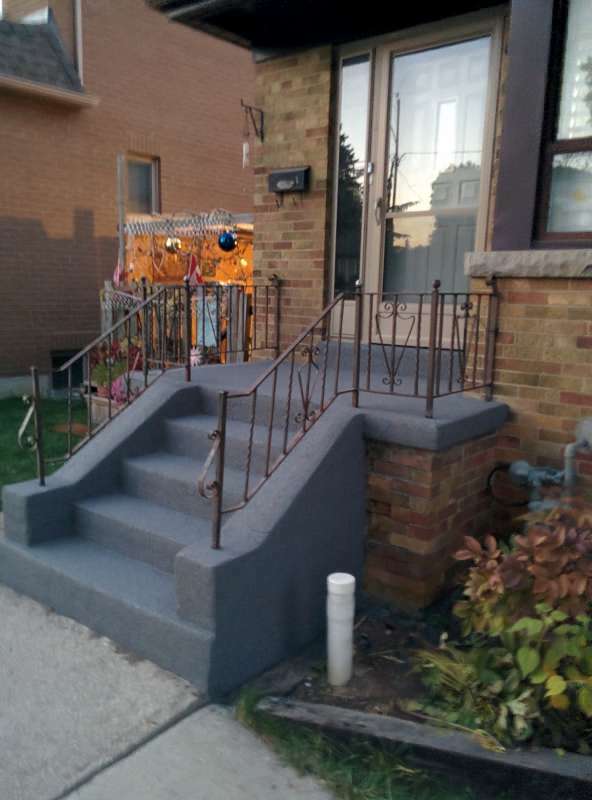 Details: Concrete front entry in good condition. 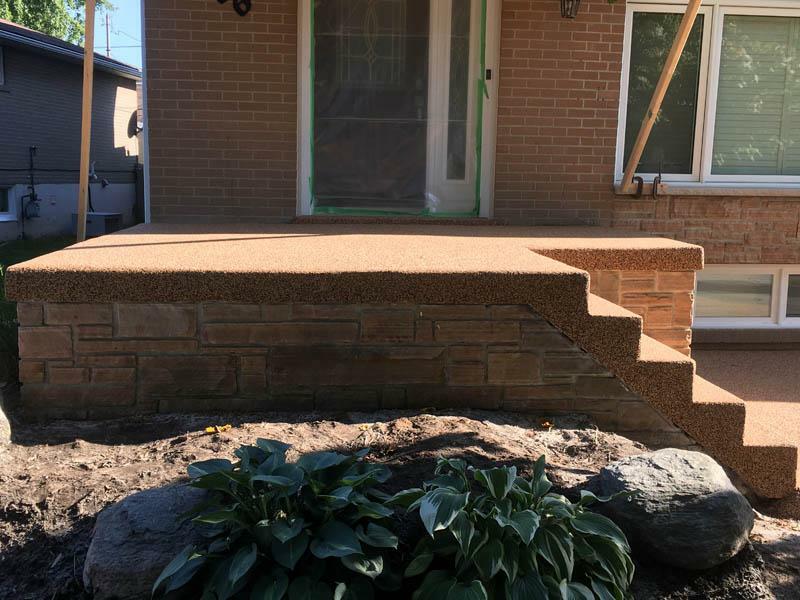 Client wanted to add some curb appeal to the front of their house as well as make the front entry safer for friends and relatives to use. 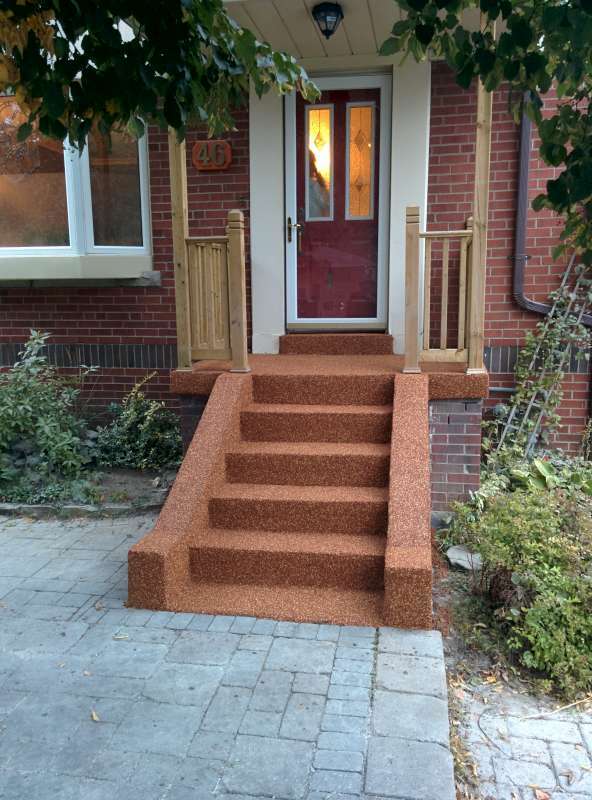 Details: Concrete front entry was designed with a brown, beige and red mixture to match the bricks and newly created wooden railings for the front of this house. 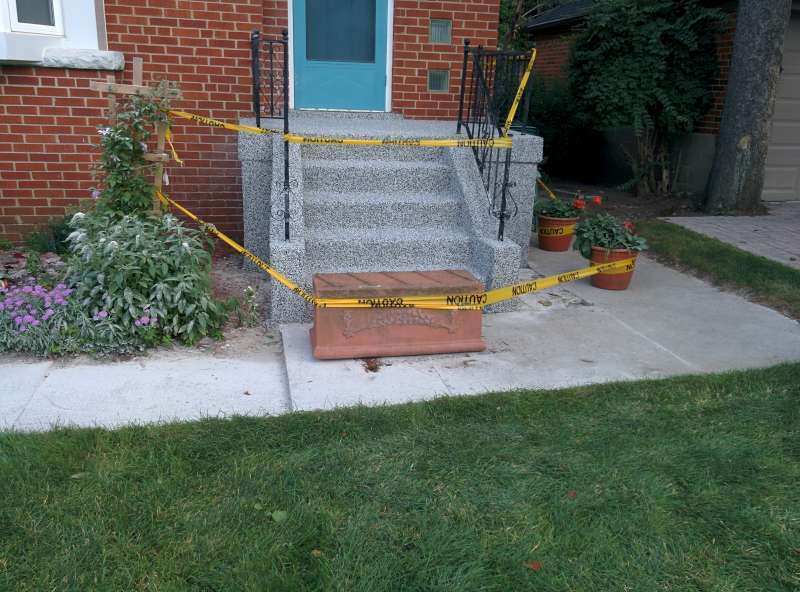 Details: Older concrete front entry had deteriorated due to age and salt exposure. 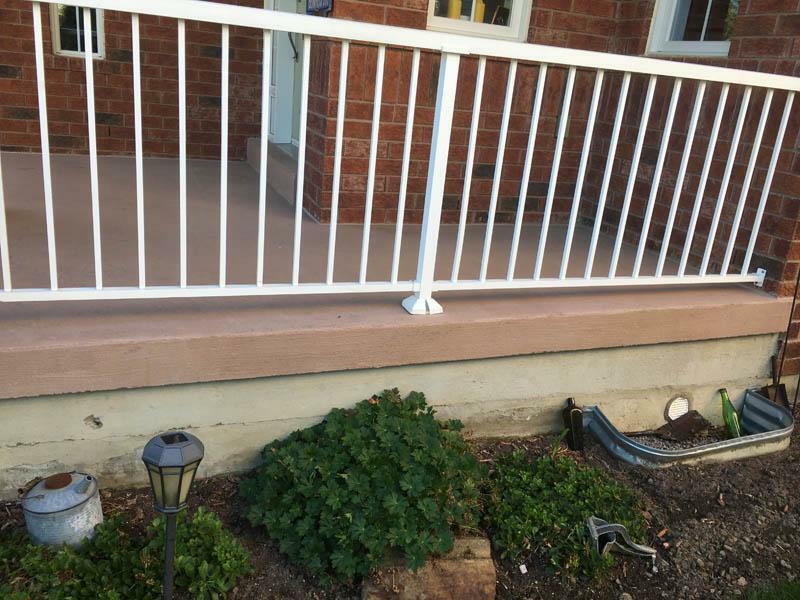 Safety and appearance had become a concern. 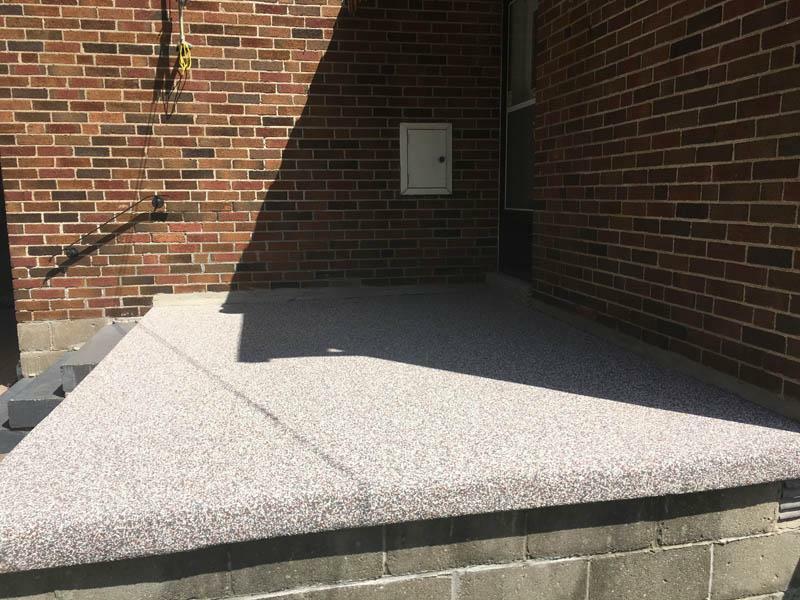 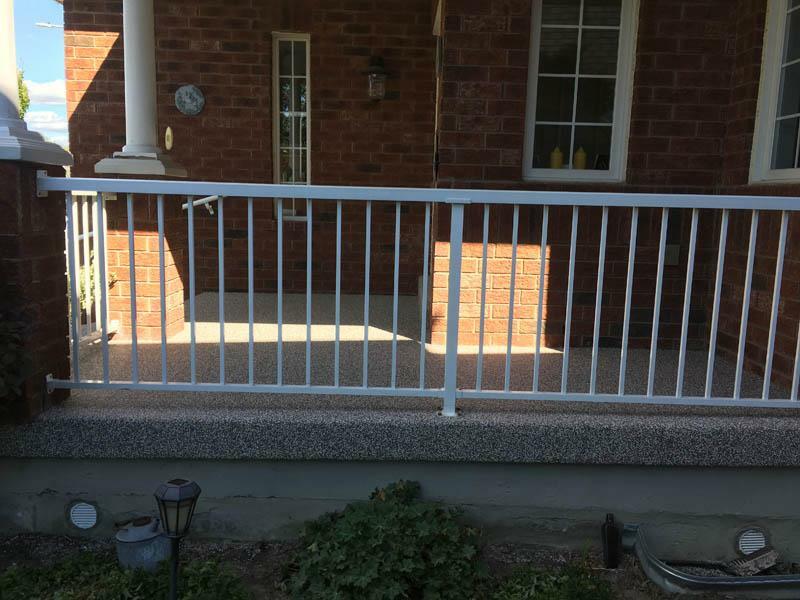 The area was re-formed with concrete to create a solid and safe structure and then resurfaced to protect the new concrete from salt and ice damage. 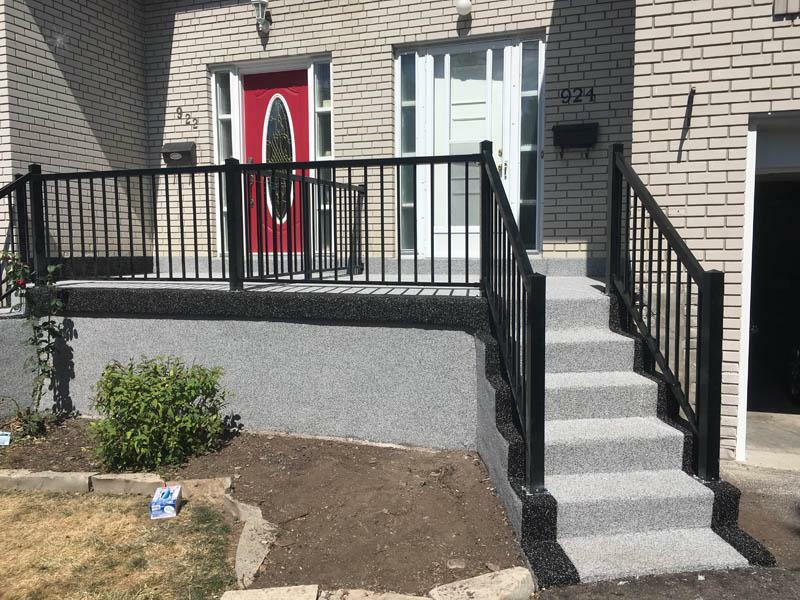 Details: Front entry was resurfaced with the addition of black safety strips across the nose of each stair to create a high visibility marker for each step. 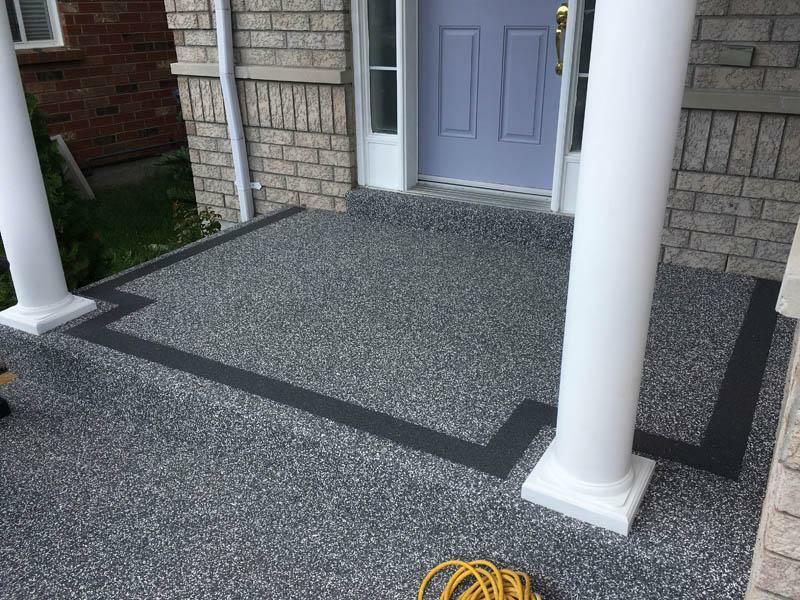 Created in a grey scale to match the black visibility markers this front entry really stands out on the street. 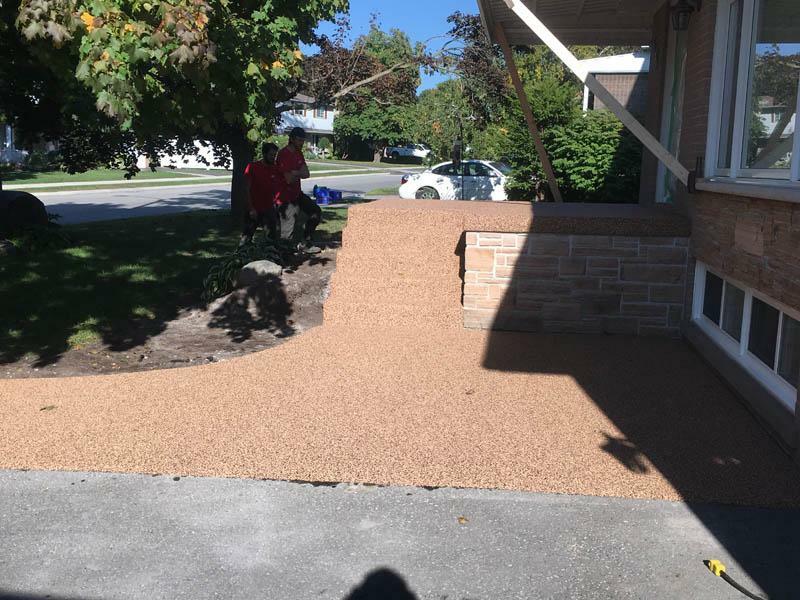 Details: A smooth transition from the driveway to the house was interrupted by un-level asphalt and concrete. 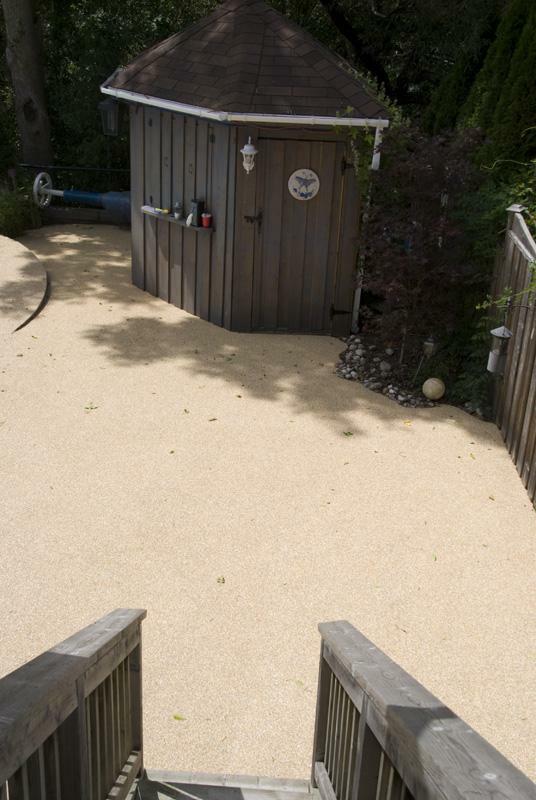 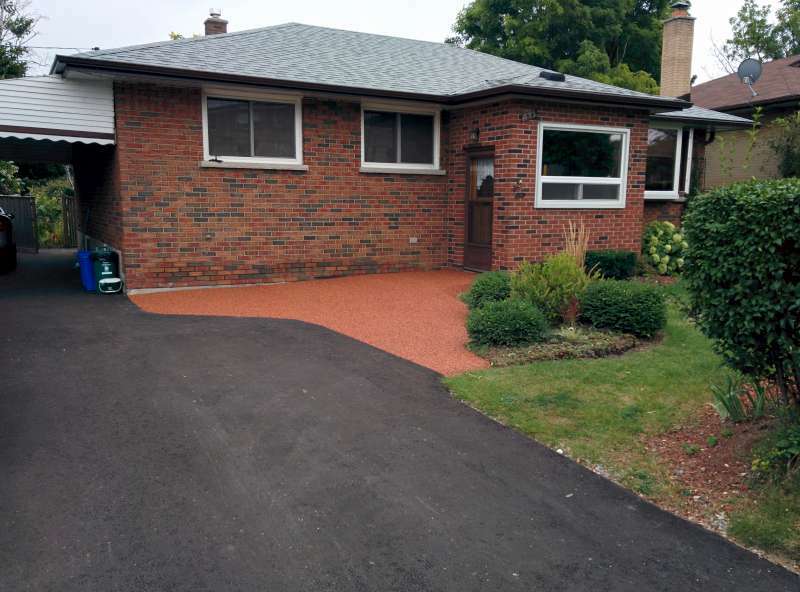 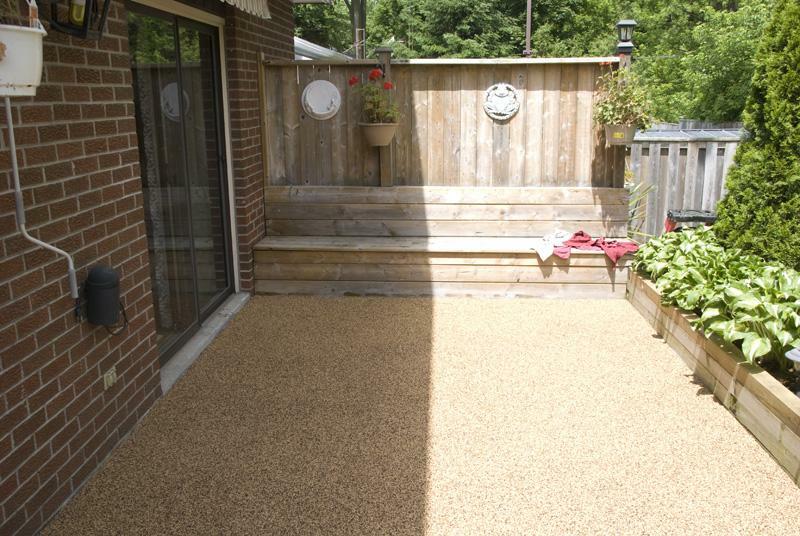 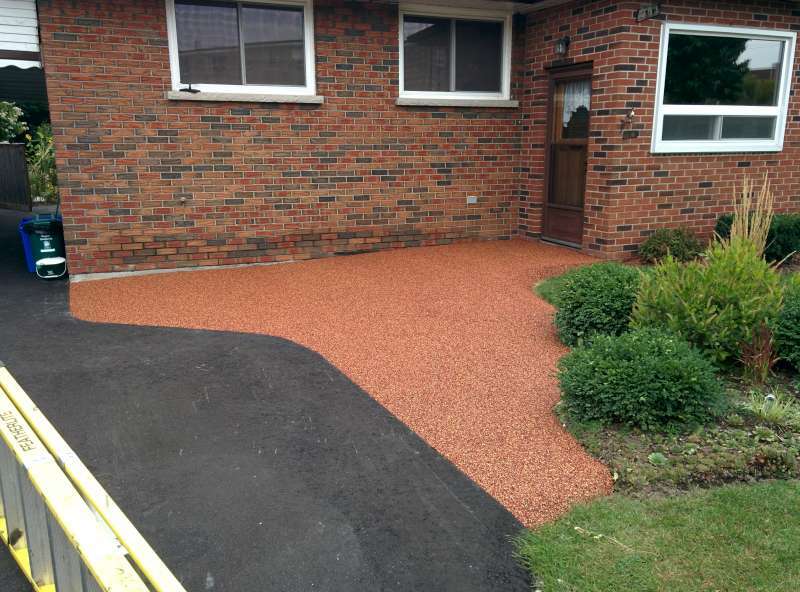 The area was smoothed and re-leveled using SBR rubber and then re-surfaced with a coloured top coat of EPDM rubber to create a safe and smooth transition into the house. 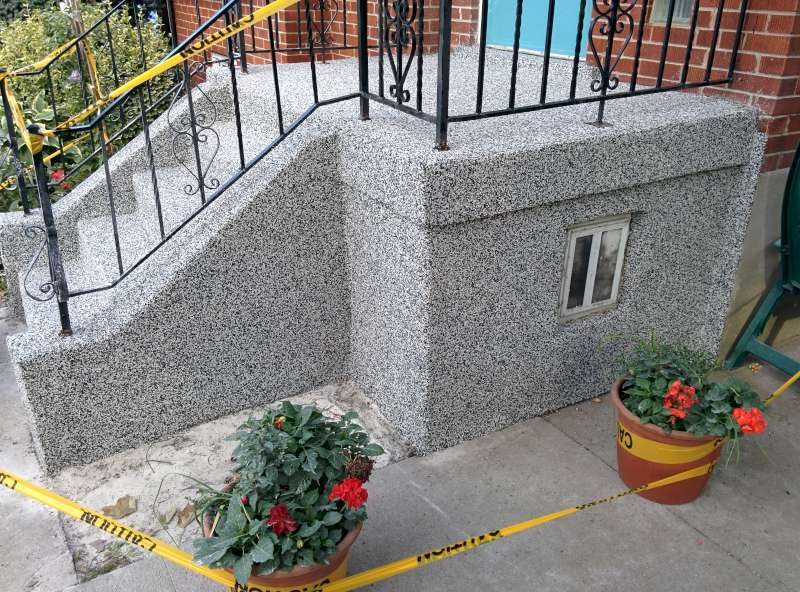 Details: This front entryway is shared by both neighbors and had two different surfaces. 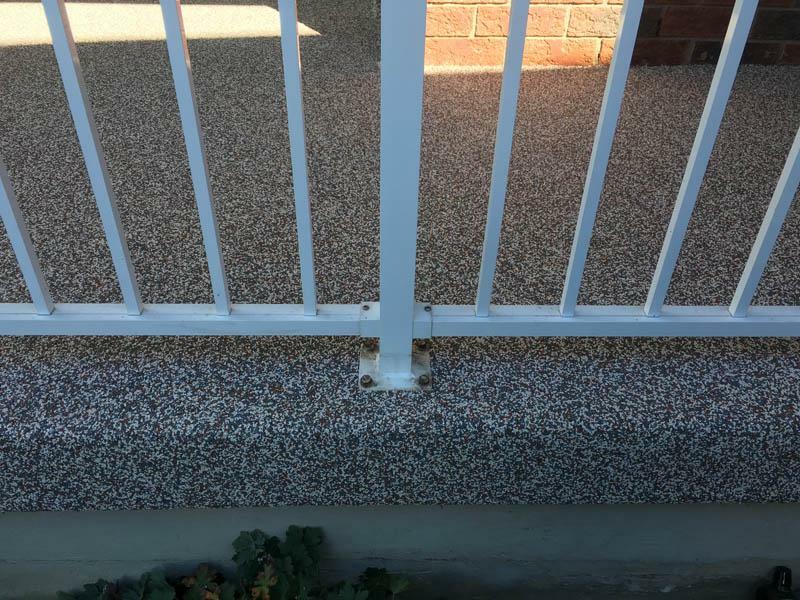 One side was exposed concrete and the other side had been sealed with an epoxy coating. 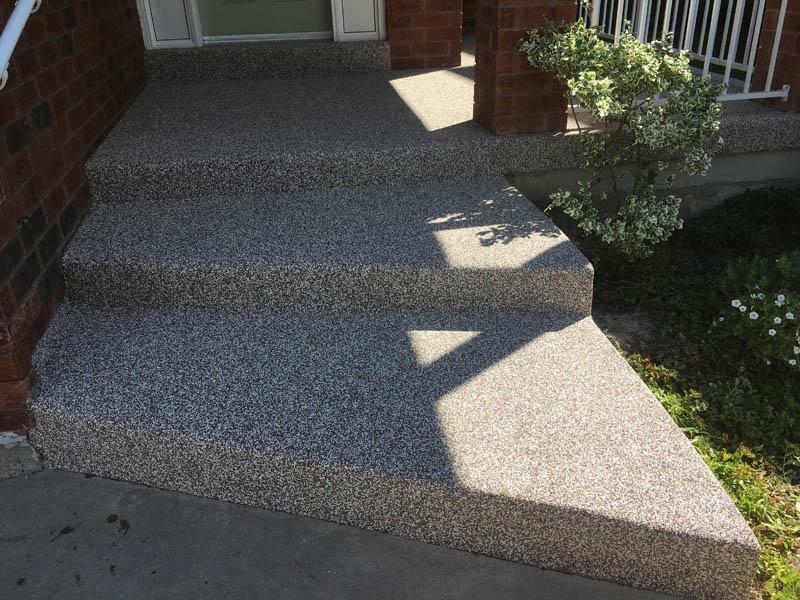 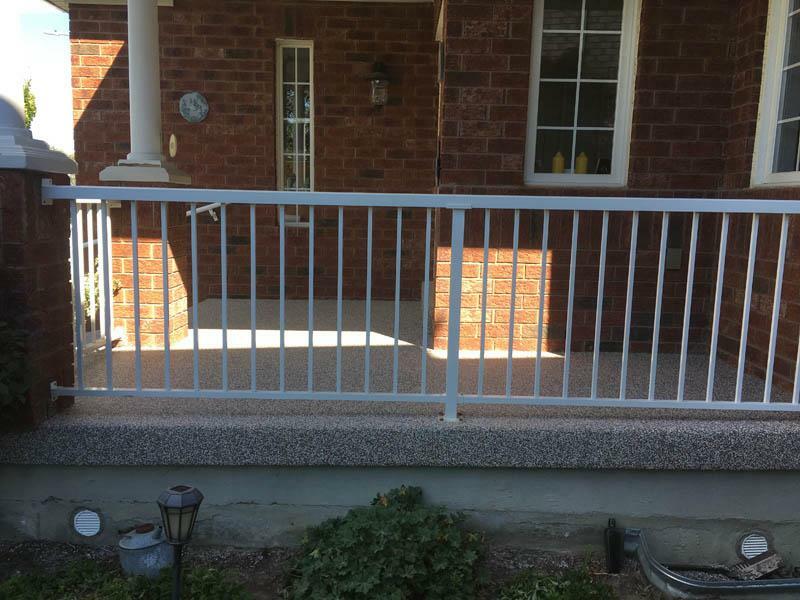 All coatings were removed and many areas of the concrete required repair and replacement. 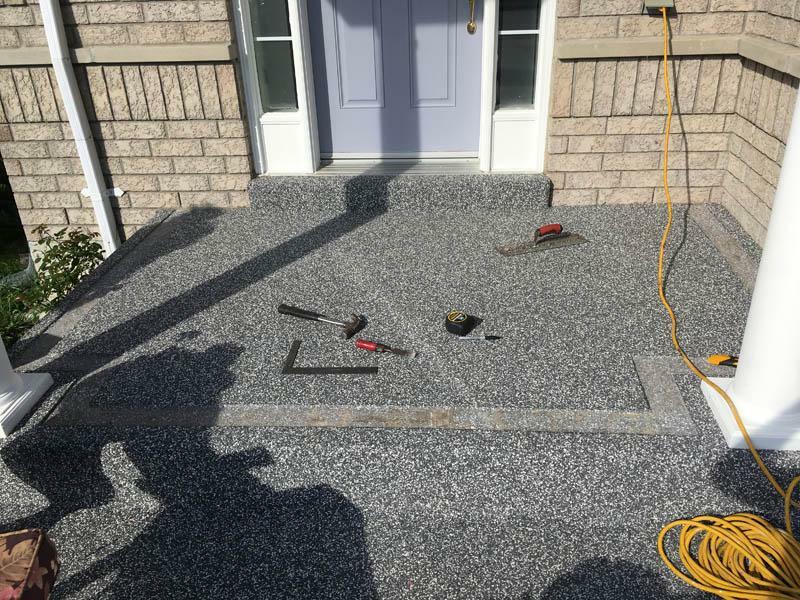 After the concrete work was finished we sealed the entire surface and applied a beautiful Light Grey and dark Grey surface with a solid black boarder. 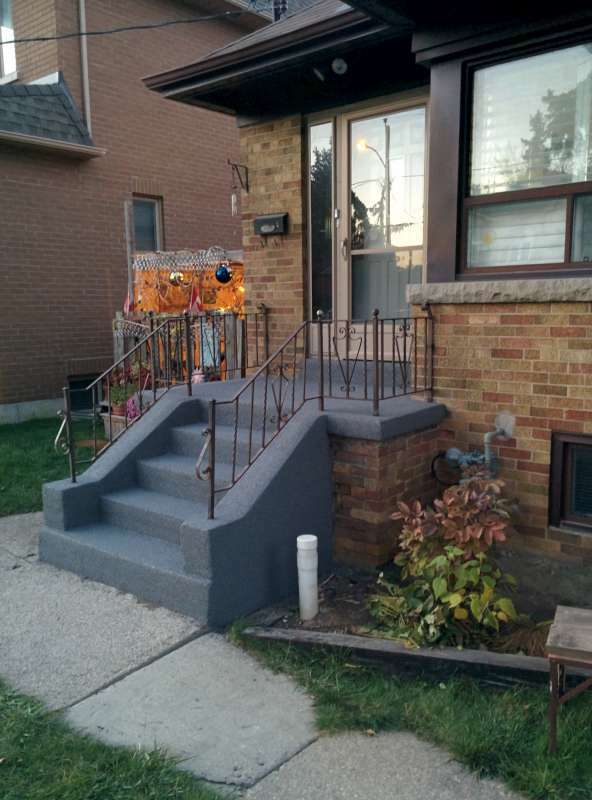 Details: This concrete front entry was painted with a salmon colour. We removed all the paint to expose the concrete, and sealed the concrete to protect it against salt and water. 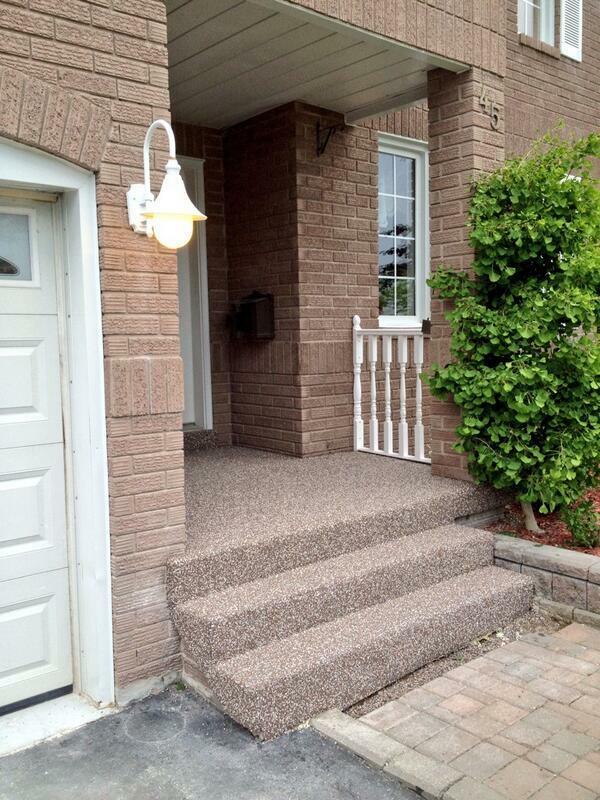 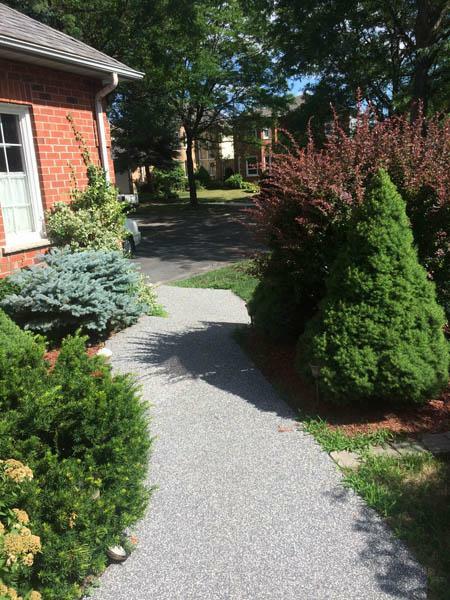 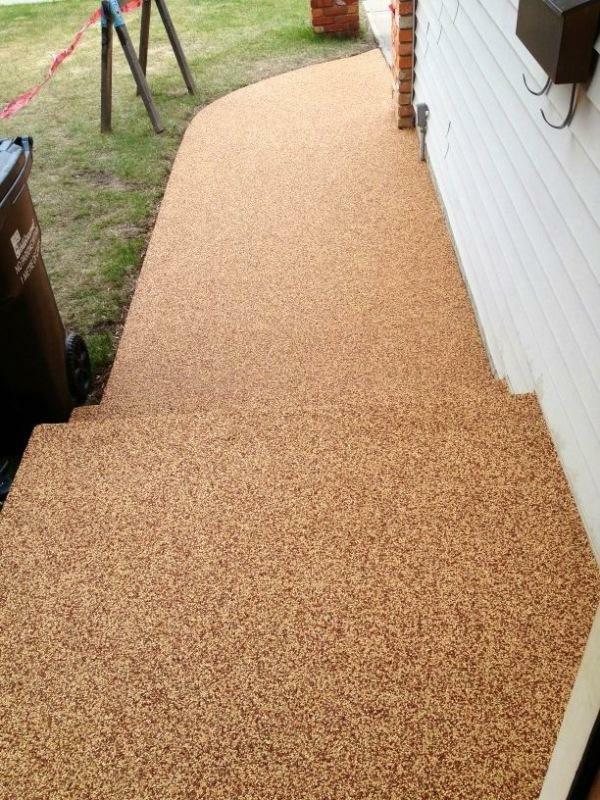 Next we applied a new surfacing of Rubber F/X to freshen up the appearance and create a safe non-slip entryway. 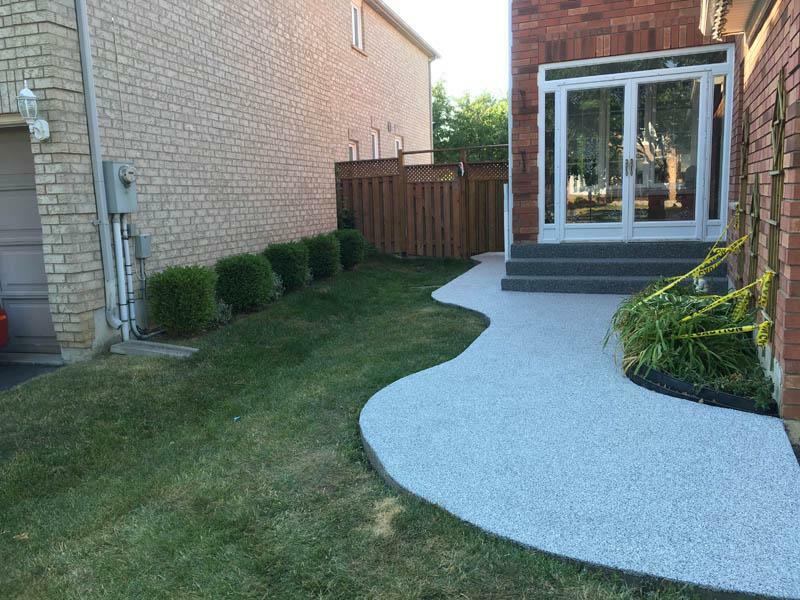 Details: A concrete front entry with patio stones laid in front was updated with a new "Flexstone" surface and walkway. 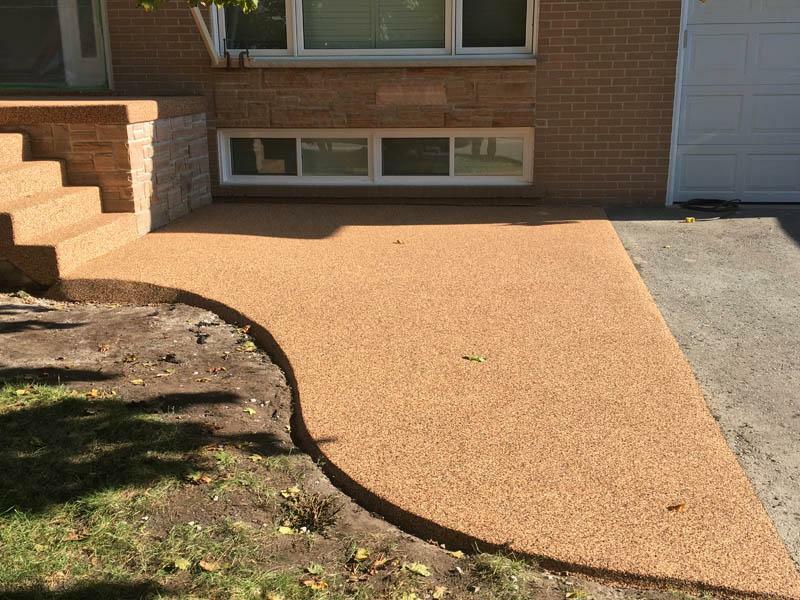 The grass was removed along with 6" of soil and replaced with a solid Aggregate base and SBR "Rubberized Concrete" surface. 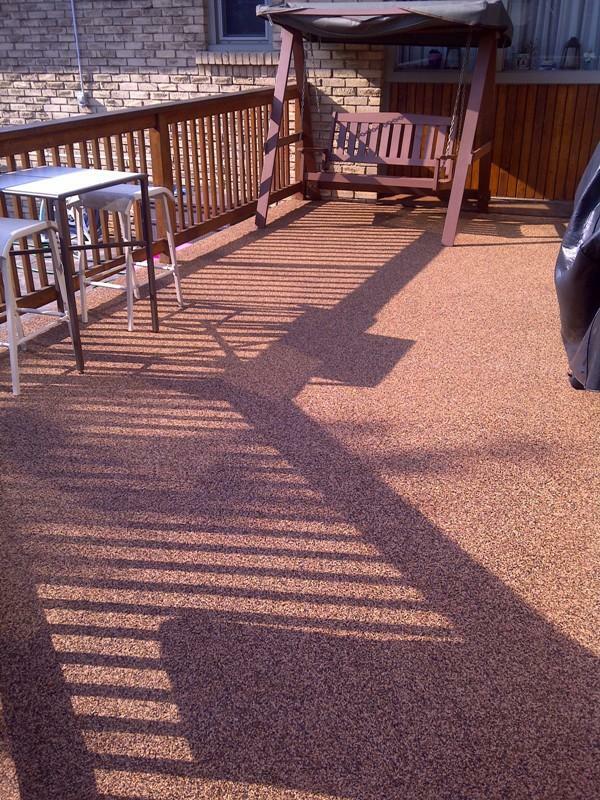 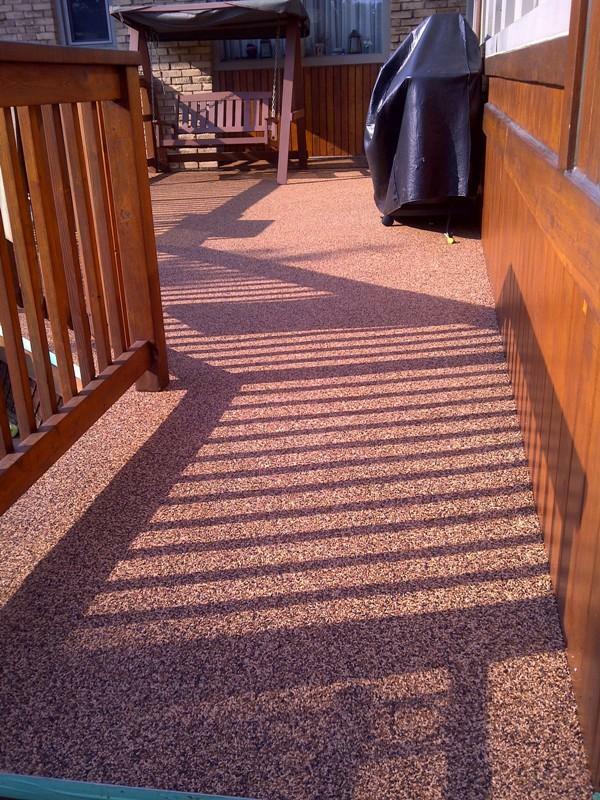 Finally a topcoat of TPV rubber surfacing completed this transformation. 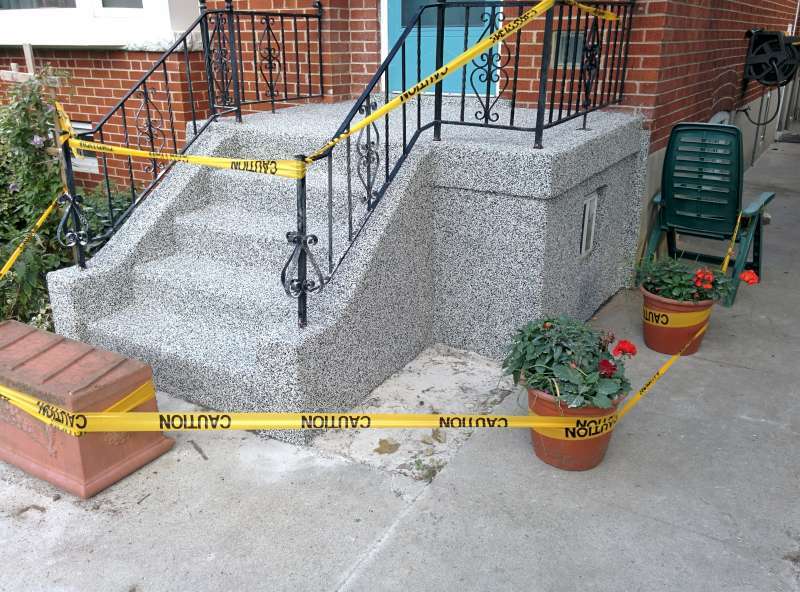 Details: This front entry and walkway was in need of a face lift and some additional safety during winter weather. 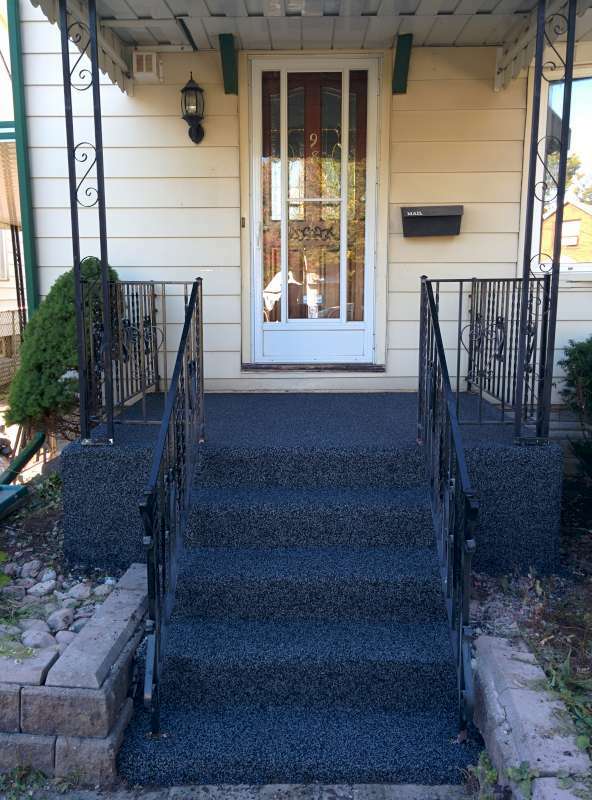 A new TPV Rubberized surface using patented Rubber F/X made for a beautiful and safe front entry.